CLEMSON, S.C. (AP) Another week, another showdown for No. 6 Clemson. The Tigers (7-1, 5-1 Atlantic Coast Conference) play Saturday at No. 20 North Carolina State (6-2, 4-0), their fourth contest – and third road game – against a ranked opponent this season. The winner grabs control of the ACC Atlantic, while a loss by Clemson likely ends its chance of defending its national title. The Tigers had a September to remember with wins over three top-15 teams at the time in Auburn , Louisville and Virginia Tech . They won games at Louisville and Virginia Tech by a combined score of 78-48 and turned expected showdowns into runaways by the third quarter. Clemson has won five straight against the Wolfpack, who may still feel the sting after nearly derailing the Tigers’ national championship run last year with a game they lost at in overtime at Death Valley. Now, it’s N.C. State with the upper hand on the season, perfect through half its ACC schedule and eager to show its strong start is no fluke. 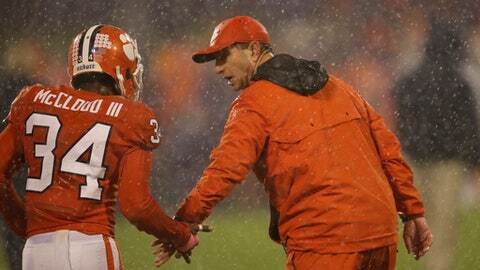 Tigers receivers coach and co-offensive coordinator Jeff Scott said there’s plenty that comes from being battle-tested and performing strongly in big situations as Clemson has the past three seasons. The Tigers are 35-3 since the start of the 2015 season, including a 12-1 mark against ranked opponents. The one loss, of course, was to No. 2 Alabama in the 2015 national title game, a defeat the Tigers avenged last January in a 35-31 win over the top-ranked Crimson Tide. The Wolfpack had that same chance to make a mark last season and potentially capture the ACC Atlantic when it outplayed Clemson much of the way. It forced four turnovers, three in the red zone, to slow down the Tigers’ high-powered offense. Still, it was tied at 17-all with Kyle Bambard lining up a 33-yard field goal at the end of regulation. Bambard’s kick sailed right and the Tigers prevailed, 24-17, in OT. N.C. State coach Dave Doeren said those who played last year will draw motivation from the defeat. His team is also aware what’s at stake Saturday. ”We want to control where we go,” he said. The Tigers gained confidence from last year’s win over the Wolfpack through the rest of the season and into this one. Their invincibility took a dent earlier this month when Syracuse stunned the second-ranked Tigers, 27-24, and threw their title defense into doubt. But Clemson answered on Saturday night with a 24-10 defeat of Georgia Tech that marked the return of quarterback Kelly Bryant, who was knocked out of his previous two games because of a sprained left ankle against Wake Forest and a concussion at Syracuse.